Quiz: Do I need PT? Discover all the latest information about injury prevention, movement, exercise, athletic performance, recovery, upcoming events and much more. For the first 25 years of my life, I steered clear of beans. It didn’t matter whether they were white, black, kidney or garbanzo; I wasn’t having any of it. Like any good daughter, I blame my mother for this. I was raised on an incredibly “clean” and nutritious diet with tons of fresh homemade food, but there wasn’t a bean in sight. This is ironic because now my dad’s favorite snack is beans and stewed tomatoes with a chaser of sardines – ugh! My own relationship with beans abruptly changed when my husband Geno and I moved to Costa Rica for a few months in 2002. I quickly learned that if I wasn’t eating beans, I wasn’t eating. For breakfast, we were greeted with Gallo Pinto (rice and beans), for lunch more rice and beans, and then again for dinner. At first I was choking it down, but after a few weeks I actually started to crave this typical bean filled dish. When we came back to the US, I experimented with all different varieties of beans and incorporated them into my diet at least a few days a week. I started giving beans to my girls when they were about six months old, and now my four year old begs for black beans and literally eats them like candy by the fistful. Makes me so happy! Today, I see beans as one of the world’s perfect foods. A ½ cup serving gets you about seven grams of fiber and protein for just over 100 calories and only one gram of fat. Beans are also a good source of iron, potassium, and folate. Research shows that this unique combination of protein, fiber, and nutrients promotes digestive health, regulates blood sugar, lowers total cholesterol and may help manage diabetes, lower the risk of heart disease, and keep normal cells from turning cancerous. If these benefits aren't enough, then you might be attracted to the fact that beans are incredibly affordable and help you feel full longer -- the ultimate secret to weight-loss without hunger. But of course nothing comes without a price, and life with beans isn't all roses. In fact, their reputation to make you a little "windy" is legendary, but throw caution to the wind! Enjoy some chili, hummus, or gallo pinto today! 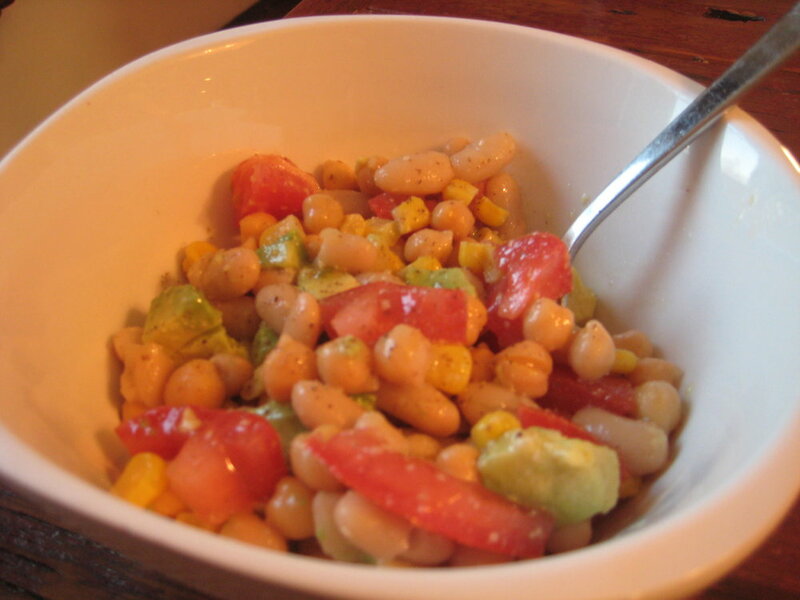 Here is a recipe for one of my favorite bean filled side dishes! Place all ingredients in a large bowl, mix gently, and serve!